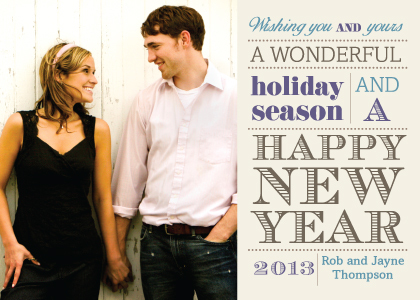 At LookLoveSend.com, we pride ourselves on our impressive selection of high quality, original custom holiday cards, including beautiful New Year's cards. However you celebrate your winter holiday season, we have a selection of New Year's cards if you are looking for something different. While all of our holiday cards and invitations are available to you online, rest assured that our knowledgeable customer service team is always available to you if need some assistance. It's easy to shop and personalize for custom holiday cards online at LookLoveSend. With your choice of color, typeface style, and personal photographs, you can make holiday cards that reflect your wishes in style. In addition to our New Year's cards, you can personalize designs for Christmas cards, holiday cards, Hanukkah cards and holiday party invitations. We have hundreds of designs for you to customize in your style, with our without photo images. Our talented designers are constantly putting out fresh, new designs for you. LookLoveSend uses only the highest–quality paper and rich inks for all our holiday cards. Turnaround time is fast, once you've approved a digital proof of your order. We won't print without your approval when you request a proof. Our customer service team works closely with our in-house designers if last minute changes need to be made. Our professional print team will make sure you are completely satisfied with your order. When you order from LookLoveSend, you can be sure your New Year's cards will stand out with style and quality this season. Our attention to detail and exceptional customer service are hallmarks of our success. Whether you want to send a holiday greeting or share news and photos, LookLoveSend is your source for holiday cards that will be treasured for years to come.